What is the serum eyelash regenerator? 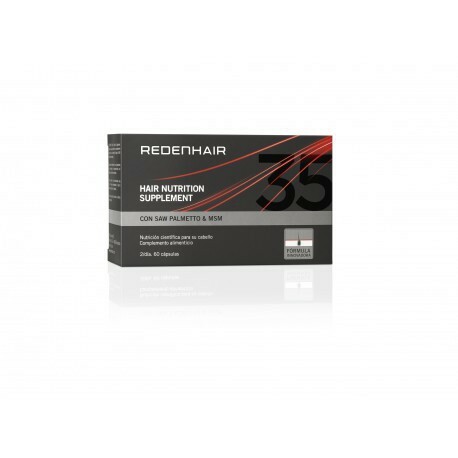 REDENHAIR capsules are a revolutionary formula specially designed to keep the hair follicle healthy, preventing oxidation and providing all the nutrients necessary to stimulate hair growth. Online sale products for Union European countries. For more countries, contact us here. It plays a crucial role in combating loss of volume by helping to prevent hair follicle regression and helps reduce the secretion of sebum thanks to its extremely high concentration of Serenoa repens. It aids the normal synthesis of proteins like keratin, which is essential for hair growth, and protects cells against oxidative damage thanks to its zinc content. With vitamin B6, it helps regulate hormonal activity and keeps the hair in great condition thanks to the biotin and a long list of essential active ingredients. 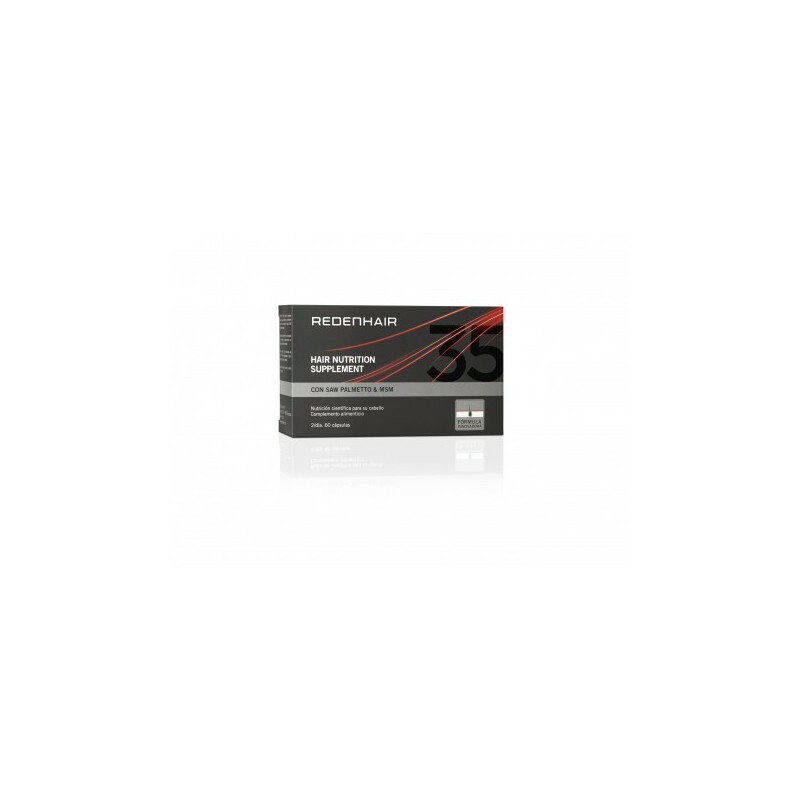 It is very important to protect the scalp against free radicals that accelerate hair loss and reduce hair growth. This is why its revolutionary formula includes the most powerful combination of antioxidants created to date. You've never been better protected. Indications: this food supplement is indicated for hair loss and to maintain healthy hair. Directions for use: take 2 capsules a day with breakfast for at least three months. Do not exceed the recommended daily dose. This product must not be used as a substitute for a varied, balanced diet. If you have any questions, ask your doctor or pharmacist. 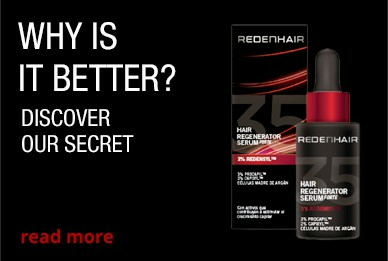 For optimum results, use alongside REDENHAIR tonic, pro-regenerative accelerator and shampoo. SERENOA REPENS EXTRACT: Each daily dose contains 300 mg of Serenoa repens extract. Many studies have shown that it attacks the root cause of hair loss, inhibiting 5-alpha reductase and preventing hair follicle regression. MSM: helps to nourish the hair. As well as hair growth, many people have also noticed an increase in hair thickness while taking it. A study conducted at Oregon Health Sciences University reported increased hair growth among participants after using methylsulfonylmethane for six weeks. VITAMIN B6: Helps ensure proper synthesis of cysteine, an amino acid that supplies structure and strength to keratin fibres. A deficiency of this vitamin is one of the causes of hair loss. PANTOTHENIC ACID (VITAMIN B5): Vitamin B5 or pantothenic acid is one of the most important substances for maintaining healthy hair and preventing hair loss, as it stimulates its hydration. GREEN TEA: Acts as a natural DHT blocker, helping to stimulate hair growth. ZINC: A trace element that is essential for hair and skin growth. Zinc deficiency leads to dull, dry, brittle hair and can even result in alopecia. It has also been shown to prevent seborrhoea, which is another significant factor in hair loss. COPPER: Copper is required to form a very strong chemical bond in hair and skin called the disulphide bond. Copper is essential in the formation of hair pigment (colour). 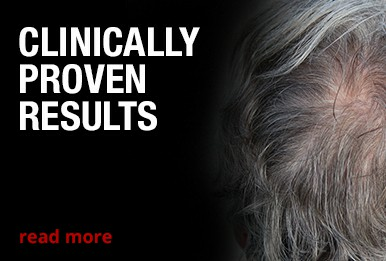 It reduces the appearance of grey hairs. IRON: This mineral strengthens your hair so that it will not break, also adding shine. It also helps oxygenate the hair follicle and improves blood flow. CALCIUM: Calcium is an essential element for hair and nails, and as it is being constantly lost, our body needs a continuous supply in order to remain healthy. L-CYSTEINE: an amino acid that is very important for stimulating the hair follicles. The formula also includes potent antioxidants such as turmeric, resveratrol and horsetail.